1. Skin stem cell research can turn adult skin cells into cells with miraculous embryonic stem cells properties without the moral disadvantages of destroying embryos in order to harvest such cells. 2. Newly reprogrammed stem cells can be coaxed to produce a bio-compatible organ or tissue virtually eliminating the possibility of transplant rejection by the host and necessity for the dangerous immune suppressant therapy that used to be necessary before skin stem cell research breakthrough. 3. Pros of stem cell research based on new findings finally outweigh the cons associated with using and later destroying a human embryo to harvest embryonic stem cells that are also short in supply. The newly reprogrammed adult stem cells provide abundant and ready available supply of mesenchymal stem cells to start saving lives. 4. 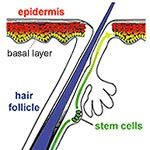 Adult skin stem cell research is believed to have more predictable results due to the whole process being carried out in a more controllable environment compared to the embryonic stem cells, that some scientists consider unstable and potentially resulting in tumors. 5. Skin stem cell research along with umbilical cord stem cell therapy options are more likely to gain more public approval and attract more federal and private funding than embryonic stem cell research with its moral dilemma. 6. Not only new skin stem cell research eliminates the needs to destroy a human embryo, the process of obtaining new stem cells is more efficient and cost effective. 7. Since the new skin stem cell research offers opportunities to produce cells very close in the nature to the embryonic stem cells, this can become a solution to treat various dangerous diseases like diabetes, for example, by injecting a patient with newly programmed islet cells that can eventually start producing patient’s own insulin and eliminate the need for day to day glucose testing and insulin therapy. 8. New stem cell treatment for heart disease can also provide hope for thousands of people with heart conditions waiting on a donor list for an implant. Their own skin stem cells could be harvested to grow a new heart or its part to replace their failing ones. 9. Spinal cord injuries are another group of disabling conditions that can be repaired with the help of newly reprogrammed adult skin cells and enable people to start walking again. 10. Alzheimer’s, Parkinson’s diseases, brain injuries, strokes are just a few medical problems that can be amended by using skin stem cell research to grow new neuron cells necessary to cure such maladies. The new skin stem cell research findings might still sound like a piece from your favorite sci-fi novel but it gives us hope that sometime in the future we can simply grow a replacement for a faulty organ, bone, muscle or tissue and go on enjoying our precious life again.